It most certainly is a numbers game. Measurements are numbers, statistics are numbers, and the determination of probable truth is based on numbers. 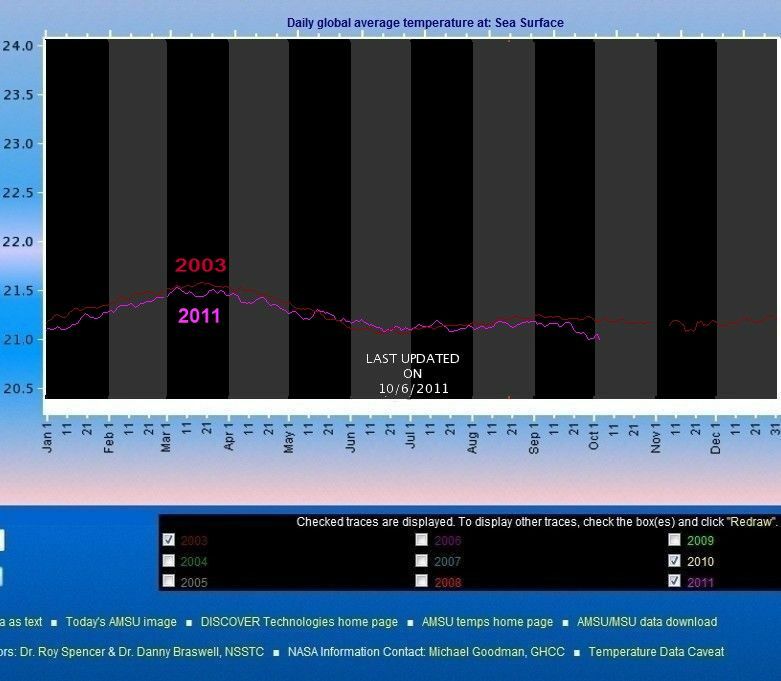 Just look at the NASA sea surface data - you can compare the daily mean for the last 12 months with that for the 12 months of 2003 and it's getting cooler at sea surface. You can just look at a lot of things and believe you see a trend. The key is being able to use the statistics to prove there is a trend to an acceptable level of confidence. You can look at the long term temperature records from many sources and point to what appears to be a change in warming or cooling, which is not statistically significant. The trends which are statistically significant are the important onesbecause they are the real ones. Yes, there are more than two ways about it. A statistically insignificant trend cannot be shown to be anything with confidence. As for reading what you write, I do that here so I do not need to read your page. However you look at it, Trenberth's estimates of ocean warming every year since 2003 have to be wrong. No, if you are talking the period showing a statistically significant trend, it does not have to be wrong. I don't blame him - there was bad data. And only a few really know what good data is? The sea surface figures would have to show it if it really happened. And we should be weighting mean world temperatures by about 90% on "over the ocean" temperatures, based on the heat stored, not the surface area of about 70%. Really? You have the evidence to support the weighting of that data where? Land measurements are also prone to urban crawl and other problems. Just keep watching those NASA sea surface figures. Including the satellite data which seems to track the surface measurments preety well? I knew of a guy who made similar claims concerning the Jupiter System of Force who seemed to be as clueless about real physics as some of your work. None of the CO2 has had any effect whatsoever? The record temperatures since temperature records were sufficiently worldwide just happened to correlate to the period during which the CO2 levels were being increased by human action? What about the unusually low period of solar activity? So you wish to say, but the evidence seems to be lacking. There are solid reasons based on physics on my home page as to why CO2 does not have a net warming effect. Actually, no, there are no "solid reasons" to why CO2 does not have a net warming effect. Here is a young scientist who can show you there is a net warming effect. And for good measure here is Mythbusters doing a similar experiment with similar results. It can also act as a scavenger, removing heat from O2 and N2 molecules and then emitting photons much more easily than those air molecules can do - thatis, CO2 can also (indirectly) cause cooling. Right ..... that is why so many scientists agree with your conclusions? Swinburn University discontinued their post graduate course in Natural Medicine in about 2005. As a result, I wasn't able to complete it but had done about half. I have also done extensive research of the research over the last 35 years or so. You are welcome to visit http://slower-aging.com Any snide remarks will be like water off a duck's back. Try http://lef.org and, while you're about it, check out the qualifications of all the doctors etc on their Medical Board http://www.lef.org/featured-articles/medadv.htm Go tell them what you think. Meanwhile, at 65, I'll get on with planning our next baby. I am not saying anything has "overturned the laws of physics." The laws of physics simply cannot be applied correctly to come to a conclusion that the world must get warmer the more we pump CO2 into the atmosphere. It is human logic that is flawed in making such deductions, not the laws of physics. Such laws do not say that only 99.7% of all radiated heat energy will get to space. Faulty models say that. What I am saying is that there is statistical evidence that there has been no significant warming from January 2003 until August 2011. In fact, there appears to have been slight cooling. Based on such empirical data over what is a sufficiently long enough period to test the AGW theory, the fact that the AGW theory does not correlate with the real world data is sufficient to debunk it. This is reinforced by theoretical considerations of the possibility of indirect cooling by GH gases as discussed on my site and in other posts here. I have a history with a few folks making claims concernng medical based beliefs that tend to be very unscientific at best. "Correct" application of the laws of physics entails their application in all instances and your interpretations seem to want to exclude the gases, thus the laws are overturned. How can you explain the experiments where an increased level of GHG causes an increased temperature level over the control group? If the increase of only GHG causes a change in temperature the conclusion must be valid and supported by science. You are confusing models and known impacts, which is a very flawed logical base. Yes, there has been no statistically significant change in temperature during that period. That is not uncommon if you look at the historical record over the last 150 years of measured temperatures. There are a multitude of impacts which can and do vary in ways which are independent of each other. For example, there has been an unusually low period of solar output, which decreases the available energy for warming. Based on such empirical data over what is a sufficiently long enough period to test the AGW theory, the fact that the AGW theory does not correlate with the real world data is sufficient to debunk it. It does not? The real world data does seem to show the correlation very well. This is reinforced by theoretical considerations of the possibility of indirect cooling by GH gases as discussed on my site and in other posts here. Anything is possible, including that the laws of physics will change for some reason, but the probability is very, very low. The very fact that you even talk about applying the laws of Physics to gases shows your complete misunderstanding of the greenhouse effect, which has nothing to do with physically "trapping" warm air in the atmosphere like a blanket. It is all about excess radiation into the oceans - not the physical movement of warmer air - go read what IPCC actually said as I really don't have time to keep re-writing the content of my site for people who are too lazy to read it directly, including the second page. Cycles by definition go up and then down, but the temperature trend is an upward one, which is therefore not caused by the cycle you belief is the cause for the warming. The very fact that you even talk about applying the laws of Physics to gases shows your complete misunderstanding of the greenhouse effect, which has nothing to do with physically "trapping" warm air in the atmosphere like a blanket. No, it does not have anything to do with physical trappng of heat nor did I even make such a claim. I do not see how you leaped from the laws of physics not being applied to gases in your "theory" to anyone claiming a physical trapping of warm air. It is all about excess radiation into the oceans - not the physical movement of warmer air - go read what IPCC actually said as I really don't have time to keep re-writing the content of my site for people who are too lazy to read it directly, including the second page. No, it is all about retaining heat energy within the atmosphere, which includes the heat sink capacity of the large portion of the planet which is covered by water. You claim everyone is too lazy to read your pages, but when I do and disagree with the statements you claim it is my lack of understanding. You do not explain nor expand any additional information. It is almost as if you have gone as far in your ability as possible and cannot provide any further explanation. Since you agree there are cycles, why then did the IPCC base trends on a short period 1970-2000 when both the long-term 934 year cycle and the 60 year cycle were going up? Why didn't they take cycles into consideration in their forecasts to 2100 which will not happen. This is my forecast: cooling from 2014 to 2027, warming 2028 to 2058 which will be 1,000 year maximum (about 0.3 deg higher than present, then long term trend goes down about 3 degrees by year 2500. Hang around! How is it "off track" to point out the fact of cycles being, well, cyclic in nature and go down as well as up. Cycles do not tend to indicate an increasing or decreasing trend by themselves. Cycles can be superimposed - eg 934 year cycle, 59.6 year cycle and 39 month cycle. Yes, many things can be superimposed, but the key is whether there is a probable causation effect or whether there is just a coincidental relationship. See http://earth-climate.com/planetcycles.jpg where you can also read how carbon dioxide can also have a cooling effect - but that is based on quantum mechanics which you may not understand, like most climatologists. From what I have read I do not think it is the climatologists who are lacking in understanding of quantum mechanics in this case. I see no need to continually increase your visitor count by trying to find your supposed reference. If you wish to quote a specific portion you believe is applicable I will read it, but I will not continually visit your site looking for random evidence of your claims here. Not sure what you are trying to say here. Ice is a heat storage mechanism or heat generating mechanism? Since you agree there are cycles, why then did the IPCC base trends on a short period 1970-2000 when both the long-term 934 year cycle and the 60 year cycle were going up? Firstly, the global temperature data becomes much less reliable once you pass the mid-1800s so the error bars for the large cycle would far exceed the accuracy needed to make such a determination. Secondly, the IPCC has not limited the trends to the period based on 1970-2000 at all. I assume you are referencing the determination of the increasing nature of the temperature trend, which would require a comparison of sections, but without a specific reference on your part it is only an assumption. Why didn't they take cycles into consideration in their forecasts to 2100 which will not happen. You assume they will not happen, but I have seen many claiming there would be a major cooling "in a couple of years" for several years now. The claims without supporting evidence are easily made and it seems easily forgotten by those who made them. Right. and when the forecast fails they dig you up to ask why you were wrong? 1. An interval of time during which a characteristic, often regularly repeated event or sequence of events occurs: Sunspots increase and decrease in intensity in an 11-year cycle. Without the increase/decrease in the cycle there is no cycle, but just an increasing or decreasing trend. Good night - it's 1.00am here in Sydney. Odd, there is no scale for temperature listed, just a pretty picture with notations . A pretty picture, but one without a means to support with real world data. Notice how the real data shows little of the major swings in the pretty picture. The dip between 2003 and the present does not seem to overcome the higher peaks as the running average does not show the cooling you claim. read it all, then come back. Bye bye!!! I thought he had a agruement that was at least curious: I wanted to let others take a gander at his site and see what they thought.